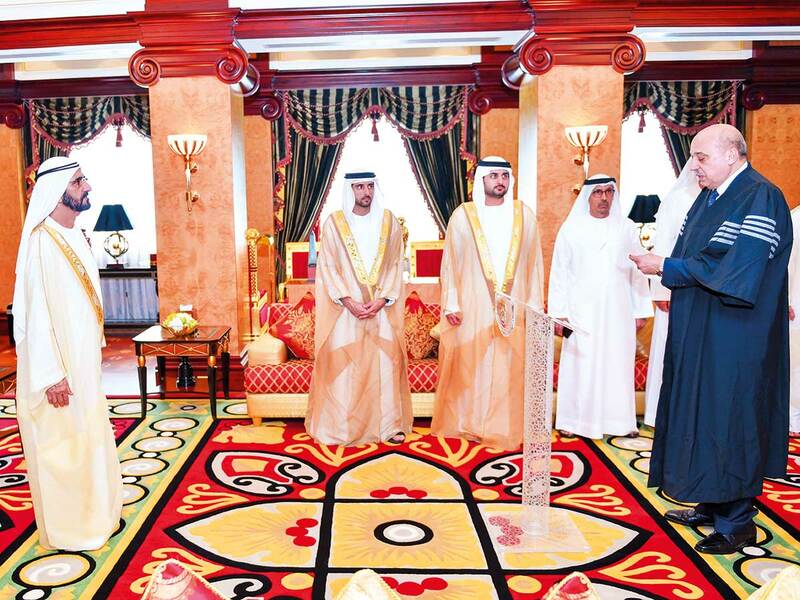 Dubai: Four new judges and three prosecutors were sworn in before His Highness Shaikh Mohammad Bin Rashid Al Maktoum, Vice-President and Prime Minister of the UAE and Ruler of Dubai, yesterday (Wednesday) at Zabeel Palace. The judges and prosecutors took the oath pledging to rule fairly and perform their duties honestly and faithfully and respect laws in the country. Shaikh Mohammad wished the new judges and prosecutors success in their new assignments and urged them to keep in mind the fear of Allah Almighty, respect for laws in Dubai and the UAE and protection of human rights and dignity, regardless of their social status, nationality or geographical and cultural affiliation. The swearing-in ceremony was attended by Shaikh Hamdan Bin Mohammad Bin Rashid Al Maktoum, Dubai Crown Prince, Shaikh Maktoum Bin Mohammad Bin Rashid Al Maktoum, Deputy Ruler of Dubai, Shaikh Mansour Bin Mohammad Bin Rashid Al Maktoum, Essam Eisa Al Humaidan, Attorney-General of Dubai; Tarish Eid Al Mansouri, director-general of Dubai Courts; Khalifa Saeed Sulaiman, director-general of Dubai Protocol and Hospitality Department, as well as other Shaikhs and senior officials.